Hello all! Matthew Dawkins here, to talk a little about the upcoming Mage: The Ascension release, Gods & Monsters. In case you’ve not checked out my Onyx Pathcast interview with developer Satyros Phil Brucato where we discuss Gods & Monsters a little, this book is the perfect grab bag, toolbox, creature collection, or bestiary (call it what thou wilt) I’ve ever seen for the World of Darkness. While its focus is Mage, the creatures and supporting characters within it range from the mundane to the godlike, and could arguably fit in any World of Darkness chronicle (with special leave given to Changeling, Werewolf, or Demon). If you like to frequent Renaissance faires, storytelling festivals, or public libraries, you and Amira may already have crossed paths at some point in the past. Perhaps she was that lady with the many-colored patchwork skirt, with a sparkle in her emerald-green eyes and a horde of children listening to her every word with silent fascination. She might have been your town’s librarian for a little while, during which everyone came to know her for her long, wavy black hair with a bright white streak to the right side, and an almost uncanny ability to find even the most unusual books for a curious kid. Maybe you noticed the fire in her eyes when she played Lady Macbeth two summers ago at the fairgrounds. There was something about her, something unique, even thrilling, but you couldn’t quite place it. Clever and crafty like all her kin, Amira is one of the more successful modern aamar. As a young djinniyah born not long after the Taftani first began enslaving her people in large numbers, she can remember how many djinn’s view on humans (especially mages) shifted from interest to anger, bitterness, or hatred. Like most young djinn of that time, she allowed the raging flames within her to control her actions and lent her strength and intelligence to the war effort. But with age came the realization that her people were fighting one pointless battle after another. 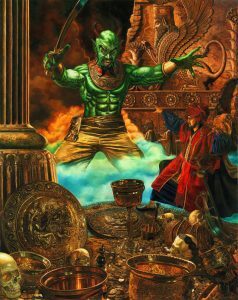 By the time humans knew the Code and seals of Solomon, the djinn had already lost thie war… yet they were still fighting it, centuries later. There must be a better way, a nobler and smarter way to make the physical world safe for djinn once more. She would find it. As she tells the tale, on those rare occasions when she has an audience who can appreciate it, Amira traveled to every corner of the Umbra in her search. Older djinn warned her not to risk throwing her life away by traveling to the only plane with a significant number of Taftani and Hermetics to bind her. But searching the Umbra for information about creatures who weren’t even native to it quickly began to seem pointless. She would have to take her chances at deep cover: disguising herself as a human to learn what they want, how they think, and with a little luck, some of their weaknesses. She resolved to use her Charms only if it were truly important, reasoning that to understand humans, she must live just as they did. She began her project by posing as a street performer in 15th-century London. She did a little juggling, some tumbling, and most of all, sleight of hand. Soon she was drawing crowds of 20, 30, 50 people or more. Most of them were children. From then on, she paid special attention to the way people who passed her in the street related to their children. She admired the care adult humans took when teaching and protecting their young. Children were much quicker than adults to believe what they were told and to take it to heart. One could plant an idea in the fertile ground of a child’s mind and, provided it was memorable enough, that idea could alter the course of their life. She would ensure her enemies’ children grew up with the truth about her people, as humans did long ago, and their wonder and enthusiasm would nourish her and keep her strong. She continued performing on the streets of Europe and eventually North America but switched to telling stories and occasionally acting in plays. She specialized in tales of humans and spirits learning to work together for mutual benefit or rescuing each other from danger. Whenever adults were looking away, or those present might accept it without fear, she used the Mirage Charm to create 3D visual aids of great cities, fantastical monsters, and her characters’ exploits. These delighted the children so much, they told all their friends to come see her show right away, just as she had expected. With ample use of Insight, Soul Reading, and Influence while telling her stories, she might only need a few centuries to create a radical shift in humans’ attitude toward spirits throughout the entire world. When she’s tired of the festival circuit, she’ll settle down in a city or town for up to a few years. She’s that cool librarian who can talk with a kid for just a few minutes, present them with a perfect book that they never knew existed, and must have failed to sign them up for late fees when they forgot to return it. This is, of course, because the book is unique, written by her, and conjured ex nihilo, a story built around whatever that child most needs to hear to become a lifelong ally of Umbrood in general and djinn in particular. Image: Amira appears as a friendly, upbeat woman of obvious Middle Eastern descent. She speaks English, Arabic, and Farsi. The white streak in her otherwise black hair suggests age, but her skin is unblemished and unwrinkled, suggesting she might be any age from 30 to perhaps 55. Roleplaying Notes: She is friendly to anyone who is willing to be civil. Any attempt to heckle or interrupt one of her stories receives first a polite warning, followed by vicious ridicule if the person refuses to stop. Perhaps the only thing that might cause her to erupt into an obvious display of her magical gifts is a threat to any member of her audience, especially if that person is a child. She considers her audience members her guests; any attempt to harm them makes her honor-bound to defend them by any means necessary. In such a situation, she prefers to start subtly with Disorient, Lullaby, or Mislead, but she’s perfectly willing to defend her audience with Create Fire, Create Wind, or even Break Reality if she must.